What do you say when your kid heads off for the school day? Hmmmmm…makes you think, doesn’t it?! 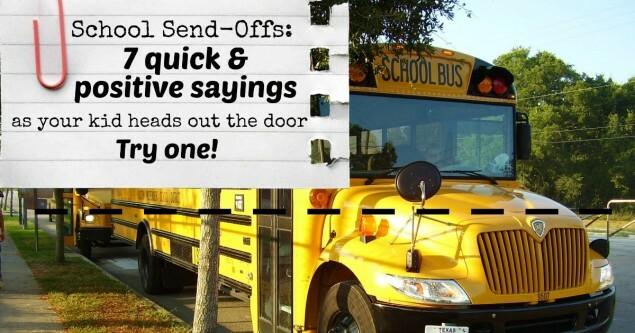 Whether sending your kids out the door to walk to school, catch the bus, dropping them off in carpool line, or even sitting down to a day of homeschool, you probably have some line you typically say to set the tone for the day. “Have a great day!” or something like that. I began to ponder biblical encouragements that could replace my well intended, but shallow send-offs. Try using some of these. Or, flip through Parenting with Scripture: A Topical Guide for Teachable Moments to find ideas for whatever area your child may need an encouraging word as he starts his day. Tired of frenetic, joy-sucking days? That’s why reading Hands Free Mama: A Guide to Putting Down the Phone, Burning the To-Do-List, and Letting Go of Perfection to Grasp What Really Matters! 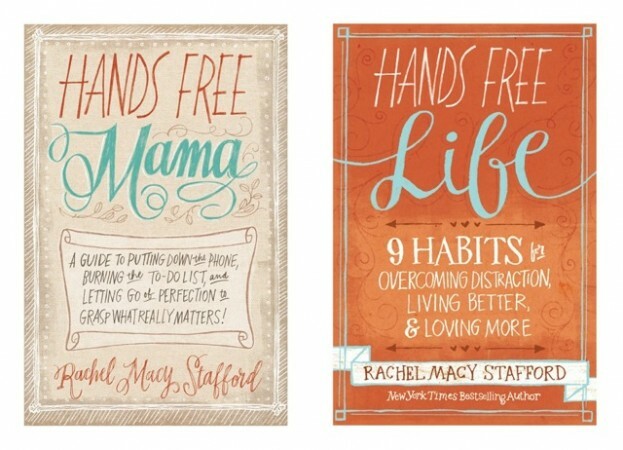 and Hands Free Life: 9 Habits for Overcoming Distraction, Living Better, and Loving More was a breath of fresh air. I was doing life in a way that made me oh. so. weary. I clung to each chapter as if it was life support. I know this sounds melodramatic, but it’s absolutely true. Rachel’s words were so nourishing that I read only one chapter a week because I needed to let them sink deep. I also wanted this new way of looking at and doing life to stick. Each Sunday, I looked forward to being reminded and renewed of my purpose for making these changes, along with discovering new points to chew on and helpful tips to implement. I’m not going to list specific ways these books helped or changed me, because I don’t want to pigeonhole them. I believe that everyone will have different take-aways depending on where you are in life. What I feel like she wrote just for me may not be the chapter that will blow your mind. God’s timing in my life for these books was perfect. No surprise there! I can honestly say that through Rachel’s books and other ways my precious Heavenly Father has worked on me over the last year, I’m in such a better place. Frenetic no longer defines my way of life or mental state. WHEW! If you are feeling this way, I encourage you to take advantage of this offer to get your hands on this material and pray that God would help use it to reveal areas where you can grow, find healing, relief, and best of all, more joy in life! What does this have to do with Parenting with Scripture: A Topical Guide for Teachable Moments? We parents can only do so much and keep so many things spinning in our heads. I want to have the time and mental space to do a better job of parenting with Scripture! Living Hands Free is helping me with that! Does your child know that she can encourage her teacher(s)? 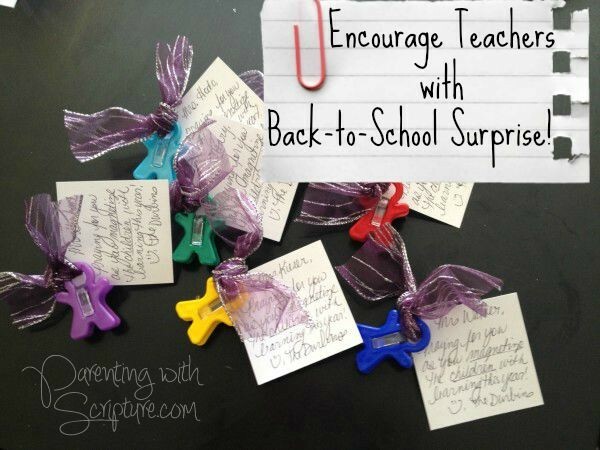 Why not have your kiddo help create a back-to-school surprise for each of her teachers? We found these cute people magnets at Mardel in store or online for just $1.50 each (price may vary). They can also be found HERE and HERE on Amazon. We discussed clever ways to word the notes and have stuck with the wording pictured below. Then, we make and tie on the tags. Most importantly, we pray for each of the teachers by name and discuss how the kids can be an encouragement to their teachers all year long through their actions, words, attitudes, and continued prayers. Finally, each of my kiddos puts them with their backpacks to take on the first day of school to give to their teachers.